The Belkin Air Protect Always-On Sleeve for Chrome books and Laptops is designed for active learning environments. 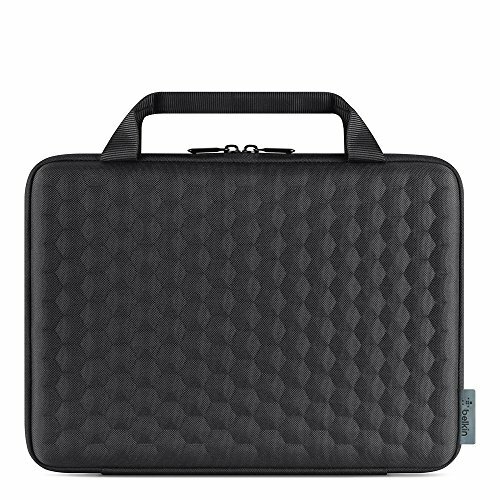 Work directly from this protective case - removing your laptop or chrome book is unnecessary which results in minimizing damage to your device. These cases feature protective padding and reinforced stiffening that absorbs impact making the Air Protect the ideal classroom case for Chrome books and laptops. Its nylon exterior will protect your investment from tears and constant usage. Innovative stay-put technology keeps your device, even in use, safely secured while giving you full screen visibility. The EVA molded base elevates your device causing optimum ventilation to ensure cool operation even after hours of consistent usage. Belkin Air Protect provides direct access to charging ports and other connections on the sides of your laptop or chrome book.